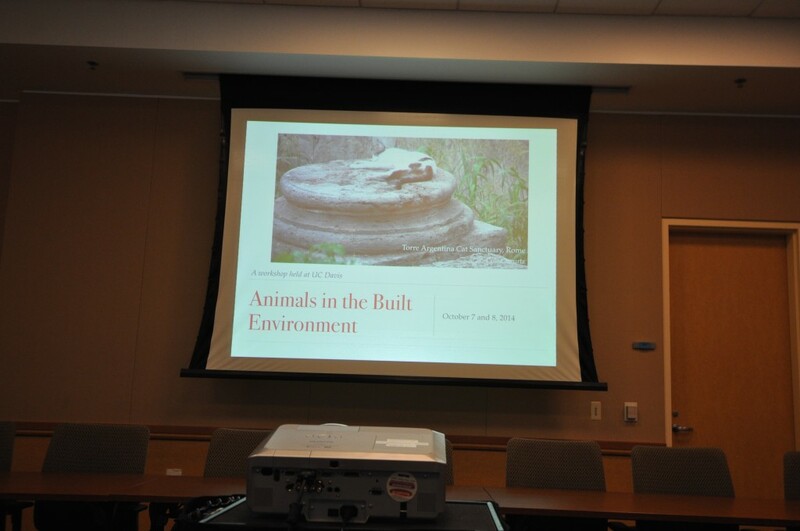 On October 7th and 8th 2014, we held a workshop at the University of California, Davis entitled Animals in the Built Environment. The aim of this workshop was to catalyze the study of the microbiology of built environments where animals live by bringing together experts in animal health, building science and microbiology to discuss why these systems are worthy of study and how research in this area might benefit both human and animal health. Broad, discovery based studies of these microbial communities are needed. Baseline data is needed to know who is there in these systems, including fungi and viruses as well as bacteria. We know a lot about pathogens and not much about microbes that promote welfare. There is a balance between what the public wants to see in places like animal shelters and zoos and what’s good for the animals. Cleaning less allows the animals to smell themselves and they may be happier and healthier. In addition to basic necessities such as food and shelter, animal housing needs to give animals a choice, a lookout, a place to hide, and stuff to smell, among other things. Gut microbiome responses to stress (and captivity) have potential for use as a diagnostic, may provide a rapid, detectable response to environmental change, and may have implications for wildlife conservation. Exposure to microbes associated with domestic animals may benefit human health. Denae Wagner, University of California, Davis, Animal health and facility design in animal shelters. Denae presented research showing how a relatively simple modification to cat housing in animal shelters reduce stress and respiratory illness. This research clearly demonstrates how building design affects animal health (as well as the importance of including animal health measures). Angela Kent, University of Illinois, Aquarium (and Chicken Housing) Microbiomes. Angela described ongoing research on the microbial ecology of marine mammal housing in two aquaria that differ in seawater source as well as amount of diurnal temperature variation. She detected higher bacterial diversity (at the genus level) in ocean water and semi-closed seawater systems compared to closed (instant ocean) systems. In addition, Angela presented research showing differences in microbial diversity patterns in chicken housing units characterized as cage-free versus traditional housing for egg production. Heather Lewis, Animal Arts, Reducing Stress with Good Housing. Heather is an architect who specializes in building animal shelters. She provided a lot of examples of how they are designing buildings to reduce stress and improve outcomes for shelter animals. Such design measures include separating waste elimination from space designated for eating and sleeping, as well as lookouts and places to hide. Deb Niemeier, University of California, Davis, Transitioning from Production Farming: Organic and neighborhood scale poultry farmers. Deb described how chicken egg production in California has shifted towards lower density housing after the implementation of Proposition 2. She is using affordable, battery-operated sensors that can be built by undergraduates and placed in difficult locations to monitor environmental conditions in chicken housing in remote areas. Jason Watters, SF Zoo, San Francisco Zoo’s Animal Wellness Program. Thriving zoo animals are key to meeting all aspects of the zoo’s mission. Jason described how the zoo’s Animal Wellness Program seeks to promote animal welfare. For example, recently they challenged undergraduate students to create new enrichment activities (Stanford University students designed a “Poop Shooter” for lions and a urine-soaked backscratcher for Floyd the giraffe). Kevin Kohl, University of Utah, Taming the Wild: the effects of captivity on the gut microbiome of wild animals. Kevin described his work characterizing how captivity and diet affects the gut microbiome of different species of wood rats. He found that animals may lose critical microbes in captivity, which has important implications for programs seeking to rehabilitate and release wildlife. In addition, Kevin presented data showing that water is an important source for gut microbes in a captive amphibian. Susan Lynch, University of California, San Francisco, Household Dust Exposure Modifies Gut Microbiome Composition and Airway Health. Susan described research in her lab demonstrating that exposure to dust from households with dogs alters the gut microbiome and provides a significant benefits to respiratory health in mice. She showed that greater microbial diversity in house dust is correlated with less wheezing and asthma. Further, she showed that Lactobacillus johnsonii isolated from this dust protects against viral infection. 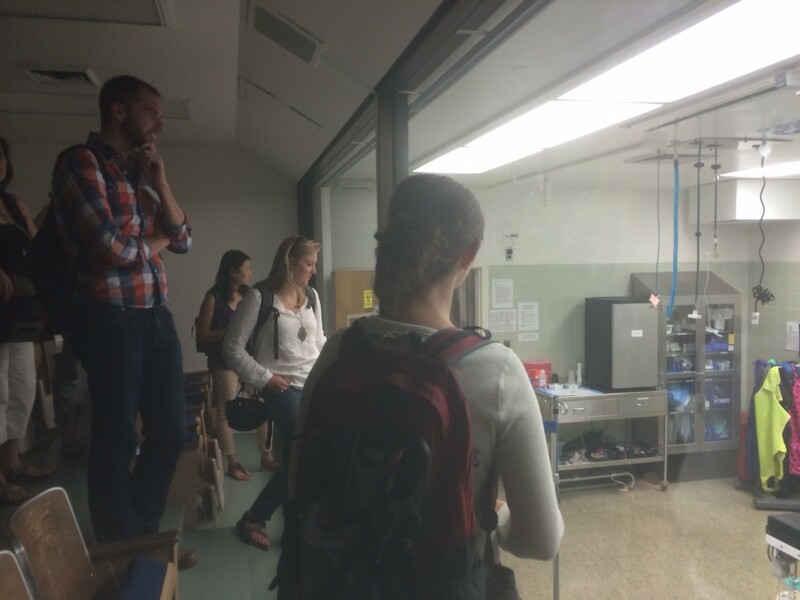 We took a tour of the Veterinary Medicine Teaching Hospital.